School Lunch: Bringing Back the Lunch! It’s the most, wonderful time, of the year! Or at least it is when you’re a parent that has been stuck at home all summer with your kids. Just kidding. I love my kids. But I am definitely ready for them to be back in school full-time. I like my routine, and while summer is fun, I ignore so many tasks because of the lack of routine. I also love to make sure my kids are eating enough, eating well, but I am not going broke. When they are home they eat three times what they eat during the school year. I like having them eat a packed lunch that is prepared with love, care, and has all the nutrition they need for their school day. So I try to find lots of different ideas and pin them to my school lunch board. I get bored with the same foods over and over — so I know my kids must have the same problem — so I try to keep changing it up for them. This month I found a new site, Belly Full. They had some incredible packed lunch ideas to put in my weekly lunch rotation. They range from the extravagant (make your own sushi), to the very simple (PB&J). You really will love the incredible ideas available. They even have some make-a-head freezer meals. I will definitely be using some ideas this week. I know build-your-own pizza will be a hit! Enjoy! This entry was posted in Food & Recipes and tagged Back-to-school, belly full, bento lunches, food, food ideas, kids lunches, Lunch, lunch ideas, packed lunches, recipes, school lunches, snack ideas, the boys store on August 10, 2018 by Lacy. School lunches are back!! Well at least they are at my house. If your kids aren’t back in school yet you may live vicariously through me as I find new and fun ways to make my kid eat lunch at school. My kids love school. They love being with their friends, learning new things and runing around. Mostly they love that they are on their own, without mama. So having a lunch packed by me, isn’t as exciting as eating something someone else’s mama packed. I try very hard to make the lunches a little more exciting in order to get my kids to at least attempt to eat their food. So far it has worked. That is why I keep looking for the next great school lunch. This month I pinned several different ideas for my kids. This was one of my favorites. My family loves all things ranch flavored. 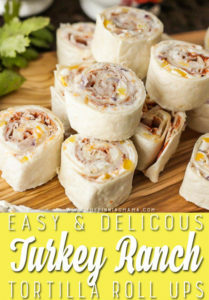 So I know Turkey Ranch Roll ups will be a hit. This fabulous little lunch idea comes from Kimber at The Pinning Mama. Kimber has some fantastic ideas for keeping the boring school lunch lots of fun. This fun recipe will make your kids excited to eat lunch. School lunches may not be a kids favorite part of the day though I am very excited to get back to it! This entry was posted in Food & Recipes and tagged Back-to-school, food, Lunch, ranch turkey roll ups, recipes, roll ups, school lunches, the boys store, the pinning mama, turkey roll ups on August 10, 2016 by Lacy.